Staring into the fridge... wondering what to make for dinner. Or scrambling to the store last minute to pick something up. Or getting take out.... or worse yet, fast food. Again. Instead of wholesome, nourishing foods at meal time, your kids are probably eating way too many granola bars, flavored yogurts, chips, crackers, or other snack food item. Because they're there. Because they're easy. ​You will learn my system for meal planning that relies on minimal time throughout the week, you will master the essentials needed to healthy shopping with or without your list, and you will end the course with the ability to make your own plan every week AND the confidence to know when to wing it instead!! Includes one week (7 days) of breakfasts, and four weeks (20 days) of dinners to get you started, plus explains how I plan my weeks to end overwhelm and keep everyone healthy and happy. This premium version includes a one on one phone call to make sure that your lunches and snacks are planned for you, and to plan out your own meal plans using YOUR family's favorite meals and recipes. This course arrives in your email inbox with a variety of downloads plus a video directly linked. Includes one week of unlimited email support as well as access to my private Facebook group. This DIY version does not include phone support. Purchase the premium version if you wish to include personalized planning time. The answer is meal planning. ​Or better yet, going BEYOND meal planning to a system in which you are eating healthy whether or not you have "planned" your meals. Take it from me. I'm NOT a natural meal planner. Before kids, I was GREAT at "winging" it! I was a MASTER at "winging" it! I could whip up gourmet meals when a first look told you all we were going to be having was pickles and mustard. And once in a blue moon this mad skill still saves me. But I've changed my ways. I meal plan. And in my obsessive dedication to nutrition and health for families, I have researched pretty much every tool under the sun that might possibly be of assistance in meal planning. ​And I have a program to help you get access to the right tool for YOU to help you streamline your meal planning efforts, outsource the tedious tasks it requires, AND teach you healthy shopping essentials to make sure that even WITHOUT a plan one week you will be sure to be getting only the healthiest, most wholesome and nourishing food for your family! Also, you continually prep food throughout the week and you prepare meals that leave PREPPED ingredients... not "leftovers" that no one wants to eat. Instead of throwing food out, yo are simply more prepped for the next meals! ​And if you have kiddos, you can serve them real ingredients that the will actually eat - not any of that stuff that is mixed up or heaved forbid COOKED! I am pretty much obsessed with food, health, and nutrition. Before kids grocery shopping was one of my favorite pastimes. And yet, things change with kids. I wouldn't say I dislike grocery shopping, I still enjoy it. But not ALL the time. Sometimes it really is a hassle. The truth is that with kids you experience good weeks and experience bad weeks. Life seems to ebb and flow a lot more when you have a family to care for. So after my obsessive dedication to finding the BEST systems to support a busy mom in her meal planning efforts, I of course used them for myself as well! And there are still weeks when I don't have a plan. For me, it harkens back to my pre-kid days when that was the way I lived, always. But for other moms, I know those weeks can be terrifying, and it feels like they last forever. 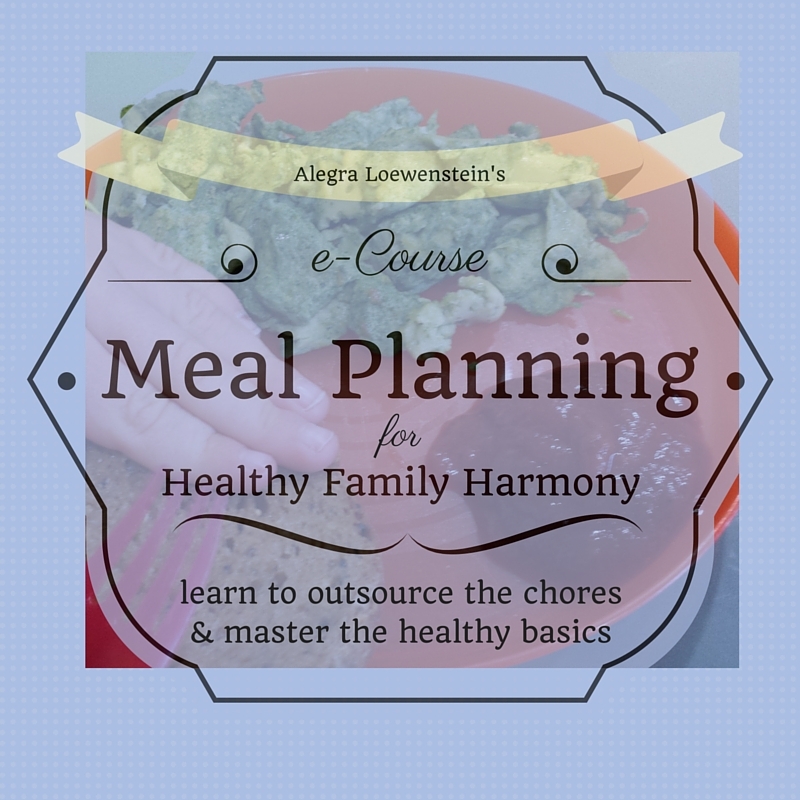 Meal Planning for Healthy Family Harmony ends the feeling of overwhelm at dinnertime. Because you will commit to one (or more) tools that suit your "meal planning personality" as part of this program, you will have a support method in your back pocket. This means that it is THAT much easier to get back on the meal planning train! Even when kids get sick, even when vacations happen or family visits. You will have the tool you need to make a plan, and quickly, no matter the reason for your "week off." And the best part? Not only will your kids be eating better, but YOU will be, too! And more of what YOU like! Your family kitchen will have so much more harmony! 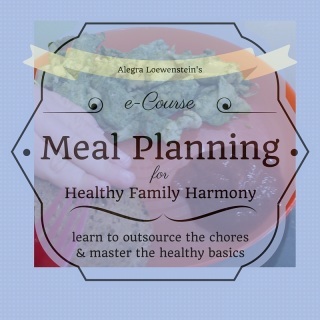 Sign Up today to get Meal Planning for Healthy Family Harmony! Seven days worth of inspiration! Access to the HealthyFamilyHarmony Facebook Group for posting pictures and getting inspired by others! All Challenge questions posted to the HealthyFamilyHarmony Facebook Group answered within 48 hours! Access to private Facebook group to gain support and camaraderie for your healthy lifestyle! That is up to $323 of value, yours for just $29 for committing to this program today! Like everything with parenting, it is important to commit and follow through. These emails come over the course of the first week to help you stick to this important change for more healthy family harmony! You will also receive ongoing support to keep you chock full of ideas and inspiration! From seasonal fruits and vegetables to making an exercise a priority to recipes and holiday tips, this ongoing resource will help you make your kitchen changes more permanent. As a health coach, I pride myself on an approach that is shaped by science, but, more importantly, my advice is built on a foundation of common sense. There are no food fads and no diets in what I recommend, ever. I want to help your family eat wholesome, healthful meals based on real ingredients that your family LOVES to eat. As a mom of two bedeviling young boys, I also bring an understanding of doing what works without wasting time on the non-essentials. I know it takes a lot of time and effort to raise small citizens, and my health coaching approach is designed to honor that and support you making healthy choices, while you raise your little citizens. We are both very busy - I get it!!!! SIGN UP TODAY, and commit yourself to making changes in the kitchen in favor of more healthy family harmony. Your little citizens will thank you! Send me a note if you have any questions!